William Barr, the man President Donald Trump has nominated to be his next attorney general, is no stranger to the job. He's been attorney general before -- under President George H. W. Bush. And in that position, he once oversaw Robert Mueller, the current special counsel, when he headed up the Justice Department's Criminal Division. Trump said Barr was his "first choice from day one" and is respected by both sides of the aisle. 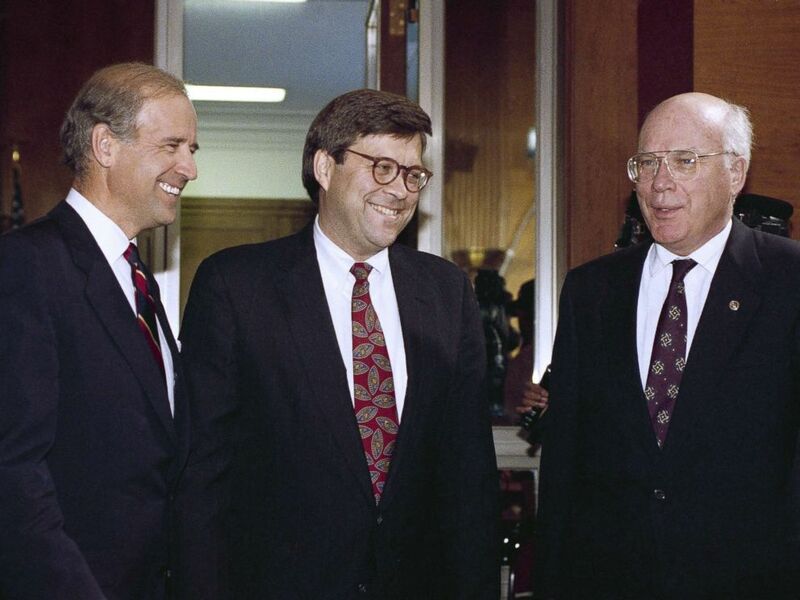 Attorney General nominee William Barr is flanked by Sen. Joseph Biden and Sen. Patrick Leahy prior to Barr?s nomination hearing before the committee on Capitol Hill in Washington, Nov. 12, 1991. If confirmed, he would replace Acting Attorney General Matthew Whitaker, who's held the top post since Trump fired Jeff Sessions last month. Here’s everything you need to know about the man who could, at a critical moment, become Trump’s attorney general. What he used to do: Barr served as Attorney General under President George H.W. Bush for two years, after previously working in both the Department of Justice’s Office of Legal Counsel and as Deputy Attorney General. He sailed through his Senate confirmation process in November 1991, receiving unanimous approval via a Senate voice vote. He served until the end of Bush’s presidency in 1993. Barr, a Columbia University graduate, worked at the CIA while attending the George Washington University Law School at night. He clerked for the D.C. Circuit Court of Appeals before working for roughly a decade as a lawyer in private practice. Since leaving the Bush administration, Barr has returned to private practice, including over a decade as the general counsel for Verizon. Barr is currently an attorney for Kirkland and Ellis, a high-profile Washington, D.C., law firm. His views on the Russia investigation: Barr has remained neutral on whether or not the Mueller probe is legitimate, but he has both written and spoken about many topics relating to players in the investigation. In a May 2017 op-ed in The Washington Post, Barr argued President Trump made the right call in firing FBI director James Comey. Barr wrote that Comey “crossed a line that is fundamental to the allocation of authority in the Justice Department” in announcing the outcome of the investigation into Hillary Clinton’s use of a private email server. On another Clinton-related investigative topic, Barr told The New York Times in November of last year he believed that there was more justification for the Department of Justice to investigate Clinton’s role in approving a 2010 sale of U.S. uranium stockpiles to a Russian energy company in what is commonly known as the “Uranium One” deal, than for investigating any potential collusion between President Trump and Russians.